We’d love your help. Let us know what’s wrong with this preview of Rules by Cynthia Lord. To ask other readers questions about Rules, please sign up. I'm in fifth grade. Is this a good book for me? I liked Harry potter and he sorcerers stone and because of Winn Dixie. Does anyone have any other recommended books? Ava Rankin-Goodman I have read "Rules" so many times and have never got bored of it. It is so simple and easy to read. I highly recommend it. This is a quick read, I read it in about a week or so. It is a VERY good book! What I liked best about the book, is how Cynthia Lord(the author) really understands how it's like to live with people with autism. I know this because she came to my school, and I met her. I liked how the book was about a who has the same experiences that I do, having a sibling with autism. I don't just recommend only people with relatives with autism to read this, I recommend everyone reading it. I have shared it wi This is a quick read, I read it in about a week or so. It is a VERY good book! What I liked best about the book, is how Cynthia Lord(the author) really understands how it's like to live with people with autism. I know this because she came to my school, and I met her. I liked how the book was about a who has the same experiences that I do, having a sibling with autism. I don't just recommend only people with relatives with autism to read this, I recommend everyone reading it. I have shared it with my Aunt, because she also has a daughter with autism. I would recommend this book to my friends so they could get a glimpse of what my life is like sometimes, because a lot of my friends and people I see really don't understand. Anna Brown I read this book in a day and it was okay. I had to read it for battle of the books. I've been trying to think of the best way to talk about this book. I read it in a night and then forced it upon my mother -who hardly ever makes the time to read- and she finished it in a night. Someday, when my sister is ready, I will have her read it too. This book was so sweet, and at moments, heart-wrenching. It's a simple story about a young girl who wants to be known for herself - not David's sister. Her eight-year-old brother has autism and because of his special needs, often takes the at I've been trying to think of the best way to talk about this book. I read it in a night and then forced it upon my mother -who hardly ever makes the time to read- and she finished it in a night. Someday, when my sister is ready, I will have her read it too. This book was so sweet, and at moments, heart-wrenching. It's a simple story about a young girl who wants to be known for herself - not David's sister. Her eight-year-old brother has autism and because of his special needs, often takes the attention of their parents. Catherine is in a tricky place. She loves her brother, so much that she regularly adds to a list of 'rules' for him - things that the average person instinctively knows or learns very quickly - but David needs to be taught. Some of the rules are hilarious, "If it fits in your mouth, it's food." Some are heartbreaking, "Sometimes people laugh when they like you. Sometimes they laugh to hurt you." Yet, as much as she cares for David, he complicates her life. Her parents thrust babysitting duties on her constantly, her father rarely spends time with her alone - but he will with David, her brother is constantly embarrassing her in front of friends and neighbors. To further complicate things, they have a new next door neighbor who's Catherine's age and she does everything she can to hide David's behavior so that her new friend won't find out. Catherine also starts up a friendship with a boy at David's therapy clinic who can only communicate by pointing at the pictures in his phrasebook. It's a good story, but it really was the moments between Catherine and David that struck me so much. My seven-year-old nephew is autistic and there were so many moments that felt all too familiar. Not all unpleasant, but familiar. One of Catherine's rules is "If you don't have the words you need - borrow someone else's." David takes this to heart and is perpetually quoting Arnold Lobel's "Frog and Toad" book to express how he feels, and Catherine will respond back with the next line. At one point, Catherine is so angry at something David does, that she refuses to respond to his usual line, "I'm sorry, Frog." The panic that David goes through when the usual routine is messed up broke my heart. It is such a fragile, sweet relationship and watching Catherine figure out who she is and, more importantly, who she wants to be is such a nice journey. I recommend this to anyone whose lives have been touched by autism or who would like to see how families deal with the day to day routines with an autistic child. A beautiful story. You can always tell when you're reading a book that has a basis in truth. With RULES, author Cynthia Lord writes about what it's like to live with autism, and she should know, since she has an autistic child. That ring of truth is there, in every word, when you read the story of twelve-year old Catherine and her autistic younger brother, David.David hates loud noises. If there's a cloud in the sky, he has to take his red umbrella with him. If his dad says he'll be home at five o'clock, David starts going crazy at five-oh-one. He likes to rewind his movie of Thomas the Tank Engine to his favorite part, over and over and over again. His favorite place to visit is the video store, where he'll even lay on the floor to read the back of the movie box a stranger is holding in his hand. And he knows all the words to Arnold Lobel's FROG AND TOAD. For Catherine, though, it's a much different story. She hates the way people stare at her brother, or even worse, refuse to look at him at all. She's jealous of the time David gets to spend, one-on-one, with their pharmacist father. She hates David's rules, the strict adherence to which he is obsessed with them, and yet she makes new rules for him every time she thinks of something else he needs to know. Catherine copes by drawing, and one day she decides to draw the boy in the wheelchair who is in the waiting room with her at Occupational Therapy. David goes there once a week to work with a therapist, and so does the boy who doesn't speak but instead uses a book of word cards to communicate. When Catherine offers to make Jason, the boy in the wheelchair, some new cards with pictures, an unlikely friendship is born. Catherine is also excited about Kristi, her new next-door neighbor, but soon finds out that friendship is a complicated matter. So, I've owned this book for more than a year but never gotten around to reading it. When I saw it had been challenged, I figured I'd read it to try to understand why. Here's why RULES got challenged: some people are effing crazy. This is a beautifully written, touching story about a family that happens to include an autistic kid. Catherine, the 12-year-old protagonist, is portrayed realistically, with a pitch-perfect kid's voice. She grows through the story, coming to better accept the differenc So, I've owned this book for more than a year but never gotten around to reading it. When I saw it had been challenged, I figured I'd read it to try to understand why. Here's why RULES got challenged: some people are effing crazy. This is a beautifully written, touching story about a family that happens to include an autistic kid. Catherine, the 12-year-old protagonist, is portrayed realistically, with a pitch-perfect kid's voice. She grows through the story, coming to better accept the differences in the people around her. The parents are loving but flawed in realistic ways. "Rules", by Cynthia Lord, is told from the perspective of Catherine, the 12-year-old sister of David, an autistic 8-year-old. Catherine, at 12, is dealing with finding a place in a family that seems to be centered around coping with David's needs for comfort and development. Catherine's mom is divided between managing a home business (leaving Catherine to care for David) and providing David the care and developmental therapy he needs. Catherine's dad seems to be mostly coping with his own diffic "Rules", by Cynthia Lord, is told from the perspective of Catherine, the 12-year-old sister of David, an autistic 8-year-old. Catherine, at 12, is dealing with finding a place in a family that seems to be centered around coping with David's needs for comfort and development. Catherine's mom is divided between managing a home business (leaving Catherine to care for David) and providing David the care and developmental therapy he needs. Catherine's dad seems to be mostly coping with his own difficulty with accepting the parenting cards he's been dealt and possibly with his own austistic-like tendencies. Neither parent, though they both clearly love Catherine, appears to have the emotional resources to cope with any of Catherine's issues. In a sense, she is expected not to have any and to participate in a semi-adult capacity in therapeutic care for David. Meanwhile, Catherine is confronting her own, normal, 12-year-old girl issues--how far should she go against her own needs and wishes to go along with her friends, who should her friends be, how to cope with mean kids, what to do with her summer when her best friend is away. What I really like about this novel is that the characters are allowed to be complex. Though Catherine's parents are, in a way, neglectful of her needs, they aren't portrayed as bad parents so much as people coping as well as they can with a difficult situation and making some mistakes in doing so. For example, there are a number of times in the novel where David is waiting for his father to come home from work and take him on an outing. David expects his father at five and becomes very distressed when he isn't home by five. Catherine notes that while she can understand that her father is characteristically late, David can't. Reading this, I couldn't help but wonder, though Catherine didn't, wouldn't one think her father could be expected to control his tendency to be late in this instance rather than repeatedly distress his son and force his daughter to cope with this distress on a regular basis? Why is it that Catherine can understand how difficult it is for David to cope with his father's lateness, but her father can't? Another good example is in Catherine's new neighbor, Kristie, a girl Catherine would like to be friends with, but whom she immediately senses will be much `cooler' than she is. Kristie, it turns out, isn't a mean girl, and it's clear she's dealing with her own issues, but she probably isn't going to be real friend material for Catherine. I also liked Catherine's relationship with Jason, a wheel-chair bound boy about her own age. She is attracted to him, but isn't sure she wants to take on more relationships complicated by disability. Jason, though unable to communicate without the use of written cards and symbols, manages to be a pretty real adolescent. He isn't perfect- he sulks and can be manipulative. Still, the reader can see why Catherine might find him compelling. If there is anything that seems unrealistic about the book, it is that Catherine is, maybe, too understanding. She pretty much accepts that her parents aren't able to be there for her emotionally as much as she might like them to be and is, for the most part, willing to accept what they can offer. She accepts her disappointment that new neighbor is probably not going to be a good fit for her as a friend without hating her. She is able to accept that a friendship with Jason is going to be complicated. Most of all, she loves her brother with all of his limitations, while understanding that if she could turn him into a "normal" boy, she would. "Rules" is actually a pretty upbeat book. In general, Catherine seems secure and confident in her ability to handle problems. Although she is coping with a number of issues, she clearly loves her family, has friends she cares about, and interests and talents outside the scope of caring for/worrying about her brother and is absolutely free of self-pity. This would probably be a great book for young adolescents coping with family issues. I highly recommend it. It's difficult having a brother with autism, and sometimes 12-year-old Catherine wants out. I love the characters in this story! Although the assignment due was to write a feminist book review, the book I read had really nothing to do with feminism at all. In Rules by Cynthia Lord, the main focus is on the main character, Catherine, and how she gets through simple day to day tasks with her autistic brother, David, by her side. In the beginning, Catherine explains how her brother does not understand a lot of things that may come naturally to most. For example, David’s father always tells him that he will be home by five, David takes this quite literally. When his father does not show up exactly on time, he begins to cry and throw a tantrum. Catherine has to explain to her brother, “Late doesn’t mean not coming”(Lord, 39). Throughout the book, Catherine is teaching her brother new rules and reminding him of old ones. When a new neighbor and potential friend, Kristi, moves in next door Catherine becomes even more consistent with making sure the rules are followed, hoping that her brother will not embarrass her. David goes to therapy once a week and while waiting for him she meets a new friend, Jason, and they soon become very close. Jason cannot speak and uses cards to communicate with people. Since Catherine is good at art, Jason’s mother asks her to make and decorate him some new cards. Jason shows his appreciation for the cards by saying, “Thank you. Catherine. New. Words”(Lord, 74). With David, Jason, and even Kristi getting more close to her, she learns many lessons from them and becomes a little more comfortable with the thought of autism and its effects. 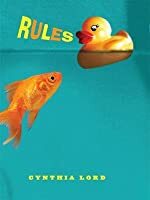 Rules, by author Cynthia Lord, is a touching look at the life of a young girl, Catherine, who's coping with the conflicting emotions of living with her autistic brother, David. And I was coping with the conflicting emotions of annoyance and boredom of reading this book. Catherine, a normal 12 year old girl, has a huge role and responsibility in the care-taking of her autistic brother, David. Catherine must balance the love and the responsibility she feels for David with the embarrassment and res Rules, by author Cynthia Lord, is a touching look at the life of a young girl, Catherine, who's coping with the conflicting emotions of living with her autistic brother, David. And I was coping with the conflicting emotions of annoyance and boredom of reading this book. Catherine, a normal 12 year old girl, has a huge role and responsibility in the care-taking of her autistic brother, David. Catherine must balance the love and the responsibility she feels for David with the embarrassment and resentment that comes along with having a family member with autism. To help David, Catherine has written a set of 'rules' that he must follow in order to help him keep his anxiety under control, and to keep him in check in social situations. At one of David's therapy sessions Catherine meets a non-speaking boy in a wheelchair named Jason, and takes a sympathetic liking to him. She helps Jason build a vocabulary of index cards with words that he can point to and help him express his thoughts. But when Jason asks Catherine to a summer dance she is torn between showing him friendship, or embarrassing herself in front of her new friend, Kris. Catherine is faced with a moral decision between what type of person she wants to be. And honestly, I didn't care much by the end of the story. Rules has some great and touching moments and does a pretty good job at showing the conflict siblings must feel having a family member with a disability. At first the story took on the feel of an overly-dramatic teenage brat who wanted everyone to feel sorry for her. But as I kept reading I decided it was an honest look at what people actually go through. But Lord's annoying style of writing in 1st person present tense and her propensity of inventing not-so-clever-overly-hyphenated-but-extremely-distracting adjectives really got on my nerves. I think this book has merit, but it is going to be put on my almost-good-but-somehow-manages-to-bore-the-crap-out-of-me shelf. As if trying to figure out who you are is not hard enough at the age of twelve, main character Catherine, is trying to create who her brother is. 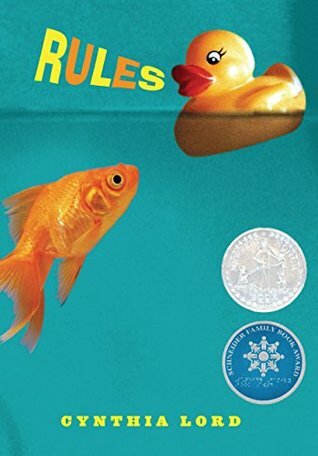 Protagonist of “Rules” by Cynthia Lord, struggles with anxiety and the fear of what others may think about her because of her autistic brother, David. As a way to shield the realities behind this struggle, Catherine creates rules for her brother to memorize and follow. The authors purpose is to inform readers about the actuality of the living with a disability or living with someone that has a disability. There are valid and key points throughout the story that connect to the third wave of feminism. Although this book is not solely about feminism it does support many concepts of it. Lord does a phenomenal job at creating a simplistic, yet meaningful story. The story line is like no other, Lord links her ideas of feminism to special needs. Equality between genders is not the main focus of this novel, but equality between people with disabilities and people without is. Catherine feels as if it is her duty to make sure her brother is looked at no differently than anyone else. This mindset forces her to take on the responsibility of David. She feels as if her parents do not do a good enough job at protecting her family's reputation. Catherine spends a lot of her time planning and stressing over how to make David a more regular person, where he will fit into the general public better and be accepted by the community. It is heart wrenching when Catherine says “Sometimes people don't answer you because they didn't hear you. Other times it's because they don't want to hear you.” (124), because this shows the struggles people with disabilities face with on a daily basis relating to acceptance. It is upsetting to think about the fact that not everyone is accepted for who they are. It is especially upsetting to think about David's own sister wishing him as a different person. This becomes emotionally evident when Catherine says “Sometimes I wish someone would invent a pill so David’d wake up one morning without autism” (8). This is very eye-opening about some of the issues in today's society. Lord presents the issues in affective ways by adding characters in an unconventional manner. By adding characters in a whole new way, Lord is able to add types of characters that are not usually popular within our cultural views of literature. The layout and style in which this story is written is important in means of understanding each abstract idea from the main character better. Some may argue that the reader is not given enough informational incite about how the other characters are feeling, but the author's intentions are strictly to show Catherine's point of view. It may just be a coincidence that Lord decided to add “Leaving out isn't the same as lying” (81), or it may be referring to her thoughts on her formatting techniques. No matter why it is included, it is still included and that proves a reasonable point and reinforces Lord’s method. Overall, this book is for everyone to read. It may be written at a seemingly younger level, but the meaning behind the story is intense in value. This story gives insight to what our standards should be in terms of morals and ethics. The narrative may not necessarily be a feminist piece, but it does embrace concepts of feminism like equality. It is crucial for a better social environment to help assist/maintain spreading this information encouraged by Cynthia Lord. I thought this book was really incredible. I read it in one sitting. I was glad that Lord didn't shy away Catherine's difficult and conflicted feeling about having an autistic brother. I thought the relationship she built between Catherine and Jason was natural and touching. I think Catherine is also a really relate-able character on a more general level. I haven't experienced any of what went on in Catherine's family life, but her propensity for daydreaming and getting her hopes up about a frie I thought this book was really incredible. I read it in one sitting. I was glad that Lord didn't shy away Catherine's difficult and conflicted feeling about having an autistic brother. I thought the relationship she built between Catherine and Jason was natural and touching. I think Catherine is also a really relate-able character on a more general level. I haven't experienced any of what went on in Catherine's family life, but her propensity for daydreaming and getting her hopes up about a friend who might not be as friendly as she imagined was spot on. I really liked this book. I like how in all of Cynthia Lord's books, there is a saying before every chapter. I liked how the main character had a brother with autism because I had never really read a book like that before. I recommend this book to anyone who likes realistic fiction or just a good, quick and funny read. This is a really heartfelt story that helps readers understand the strain that autism puts on an entire family. I enjoyed the array of characters and how they deal with the disability. There are those who are understanding, frustrated, confused, sympathetic, and downright mean--which is so authentic! I attended Cynthia Lord's author session at the Dublin Literacy Conference this year where she spoke about writing this book. It went through twelve revisions! I was anxious to read the book, as it This is a really heartfelt story that helps readers understand the strain that autism puts on an entire family. I enjoyed the array of characters and how they deal with the disability. There are those who are understanding, frustrated, confused, sympathetic, and downright mean--which is so authentic! I attended Cynthia Lord's author session at the Dublin Literacy Conference this year where she spoke about writing this book. It went through twelve revisions! I was anxious to read the book, as it was inspired by her daughter (who wanted to read a book about a family like theirs). Catherine's little brother is autistic. She has to have rules for him since he doesn't act like he's supposed to. Rules like Pantless brothers are not my problem or No toys in the fish tank hence the cover. As you can see there is a rubber ducky in the fish tank. There are other things that get in there because of David and Catherine makes up what they are saying there. Catherine has Rules of her own too. She has to constantly make sure her brother doesn't embarrass himself well more like her. S Catherine's little brother is autistic. She has to have rules for him since he doesn't act like he's supposed to. Rules like Pantless brothers are not my problem or No toys in the fish tank hence the cover. As you can see there is a rubber ducky in the fish tank. There are other things that get in there because of David and Catherine makes up what they are saying there. Catherine has Rules of her own too. She has to constantly make sure her brother doesn't embarrass himself well more like her. She sometimes wishes he was normal and that he could stick up for her. See there is this boy named Ryan who likes to tease David and David doesn't know that he's making fun of him. I don't know how his mother doesn't know he is like that but whatever. Kristi is her new next door neighbor. She so badly wants her to be her best friend and play at the pond or use Morse code with flashlights. She discovers that she isn't the ideal friend especially since she likes to hang out with Ryan but she does show some morals I guess you'd say. She teaches something to Catherine that you wouldn't have expected from her. If I could be objective, I would probably give this book a higher rating. My son with Autism read this book with his 5th grade class. One would normally identify with the main character of this book, 12-year-old Catherine who's younger brother, David, has Autism. I can't help but wonder, though, if my son identified with David (being that my son is a younger brother with Autism). It makes me cringe to think this as Catherine is clearly embarrassed by David. At one point, she even compares him to If I could be objective, I would probably give this book a higher rating. My son with Autism read this book with his 5th grade class. One would normally identify with the main character of this book, 12-year-old Catherine who's younger brother, David, has Autism. I can't help but wonder, though, if my son identified with David (being that my son is a younger brother with Autism). It makes me cringe to think this as Catherine is clearly embarrassed by David. At one point, she even compares him to a rotten apple (something to the effect of he looks OK on the outside, but is brown and mushy on the inside). I have worked so hard on teaching my son that he is different, but not less than anyone else. I felt this book was going against what I have been trying to teach him ever since I explained to my son that he has Autism. He has been struggling some with his self-esteem since reading this book and I can't help but think there could be a connection. There is a sweet side story where Catherine befriends a boy in a wheelchair named Jason (thus the 2 star rating instead of 1). It seemed like this experience was starting to soften Catherine's feelings toward David, but it never fully developed and I was left feeling like there was no real resolution. Maybe that was the point -- how life is when you live with a sibling with a disability? I finally got my hands on RULES by Cynthia Lord, and I read it in one sitting. The narrator, Catherine, genuinely seems twelve. Her mannerisms and thoughts ring true, especially her artistic view on life and her lists of rules to help both herself and her autistic brother David. Catherine has more than shallow run-of-the-mill problems to deal with, and yet she's easy to identify with. In less capable hands, the story could have come across saccharine or depressing. Lord pulls it off in a way tha I finally got my hands on RULES by Cynthia Lord, and I read it in one sitting. The narrator, Catherine, genuinely seems twelve. Her mannerisms and thoughts ring true, especially her artistic view on life and her lists of rules to help both herself and her autistic brother David. Catherine has more than shallow run-of-the-mill problems to deal with, and yet she's easy to identify with. In less capable hands, the story could have come across saccharine or depressing. Lord pulls it off in a way that seems effortless. She does a great job with pacing as well. From the premise of the book, I expected it to be a slower read, but the story strides along confidently. Such delight! This touching, funny story -- a quick, compelling read for a sunny afternoon -- is both respectful and adorably irreverent. Catherine is the voice of a wise, practical observer whose perspective has been sharpened by life with her autistic brother and her disabled friend. There is nothing here which is inappropriate for any reader of any age; and there is much here that is valuable for everyone, whether or not they know or are related to people who have autism or any other physical Such delight! This touching, funny story -- a quick, compelling read for a sunny afternoon -- is both respectful and adorably irreverent. Catherine is the voice of a wise, practical observer whose perspective has been sharpened by life with her autistic brother and her disabled friend. There is nothing here which is inappropriate for any reader of any age; and there is much here that is valuable for everyone, whether or not they know or are related to people who have autism or any other physical or mental disabilities. This story will be particularly valuable for all children whose siblings or other family members are challenged by any persistent disorder or disability. I read this book to help my grandson with his Battle of the Books assignment. We can discuss the characters and the important points of the story together now. I enjoyed the characters in the story and the RULES very much. I hope my grandson cares about Carherine and her little brother, David, as much as I do now. I have never met a person like Jason before but I am pleased that this story has given me an insight into what someone without words faces every day. I learned that just because someon I read this book to help my grandson with his Battle of the Books assignment. We can discuss the characters and the important points of the story together now. I just finished reading RULES for the second time, and I loved the characters even more this time around. This is a funny, touching book about a girl coming to terms with her brother's disability and what it means to their family life. It's a fantastic book for the classroom, with lots of opportunities for extension activities and discussion (and in the September Scholastic Book Order for $3.95). I read this for a book club book and it was about a girl whose brother had autism and he was very embarrasing. (at least to her) it taught me some lessons about honestly and much more! This was the first book in ages that I've finished in one sitting and I'm really happy about it!! I've started reading this book last year when I received it, but I couldn't finished. Maybe the time wasn't right and I wasn't in the mood. However, yesterday I felt like picking this one up and I just cound't put it down! This story is so true, raw, realisitic and touching! I have a cousin that has autism, so I know how David was going through. Of course that some of Chaterine's atitudes toards his b This was the first book in ages that I've finished in one sitting and I'm really happy about it!! This story is so true, raw, realisitic and touching! I have a cousin that has autism, so I know how David was going through. Of course that some of Chaterine's atitudes toards his brother wasn't kind or right, but it is trully complicated and you feel powerless around people that judges you or someone next you. I think that the author grasped the feelings and the reality in the right way and if you read this book, you will learn a little about autism and people with deficiency and understand them better. Rules is a beautiful book and it's narrated by a children of 12 years old! Which is incredible, considering that the narrayion is so clean and you can see that even though Catherine is so young, she's mature and understand a lot of things that children in her age would be oblivious at. Catherine is thrilled to learn that the house next door has been sold to a family with a girl her age. She daydreams about a new best friend. Meanwhile, she makes a new friend in the waiting room at the office where her little brother (who is autistic) goes for occupational therapy. Jason can't talk, but Catherine steadily adds words to his vocabulary. Rules and rubber ducks and running. Wheelchairs and words. Standing out and being invisible. Frustration and true friends. Loved this. Wholeheart Catherine is thrilled to learn that the house next door has been sold to a family with a girl her age. She daydreams about a new best friend. Meanwhile, she makes a new friend in the waiting room at the office where her little brother (who is autistic) goes for occupational therapy. Jason can't talk, but Catherine steadily adds words to his vocabulary. I love the human face this book gives Autism. I also like how it is told from a family member's perspective so we understand what it is like to live in a household with someone impacted by Autism. Even though my favorite character is Catherine, I really like Jason, too. He can't talk and rides a wheelchair, but he is nice and has courage. I feel good that Jason wants to have a friend, and he has. I like when he smiles in the story. When I pictured him laughing, it made happy. I like when Jason hangs out with Catherine and talks using the communication book. It is very surprising to me that even if you can't talk, you can use your communication book and still talk with someone. David has autism and because of that he has disgusting behaviors that embarrases his sister, Catherine. He needs a lot of help from Mom and Dad. He isn't good at knowing what is happening, so her sister keeps telling the rules and tips. Ryan teases David, so Catherine is angry at him. Ryan likes Kristi and she likes him, too. Kristi is Catherine's new next door friend. She is nice. And her parents are seperated. She likes to dance. Catherine's Dad really loves plants. He is the gardener, of course. I wasn't sure I would like this book at first because it is an "issues" book. I thought it would be about a girl who learns to accept her brother's disabilities, and while this is true, it was more a learning-to-fit-in-and-be-comfortable-with-yourself book. I'm still making it sound cheesy, but it really wasn't. Rather, it was hilarious and well-written. The main character, a twelve-year-old girl named Catherine, is highly relatable, and draws you in from the first chapter by telling you all abo I wasn't sure I would like this book at first because it is an "issues" book. I thought it would be about a girl who learns to accept her brother's disabilities, and while this is true, it was more a learning-to-fit-in-and-be-comfortable-with-yourself book. I'm still making it sound cheesy, but it really wasn't. Rather, it was hilarious and well-written. The main character, a twelve-year-old girl named Catherine, is highly relatable, and draws you in from the first chapter by telling you all about her "rules" for behavior that she has written for her autistic brother (which range from practical to laugh-out-loud funny). I couldn't help but love her for doing this for him. My only problem with the book was that I felt like the main character wasn't consistent; it felt like she went from being 12 to being 15 halfway through the book. She initially seems cute and tomboyish, but then all of a sudden begins to show so much maturity and becomes so precise and erudite in her word choices and in her ability to self-analyze that at times I felt very conscious of the author's own voice shining through the narrator's. Such is the problem with first person, I guess. I'm the author of the children's book, RULES."